Adam Gellert's Activation Blog: Man Overboard! In the Christian community, we like to talk about our ability to cast our cares upon Jesus. 1 Peter 5:7 says, "Cast all your anxiety on him because he cares for you." And Psalm 55:22 says, "Cast your burden upon the Lord and He will sustain you; He will never allow the righteous to be shaken." For me, when reading these verses I always had an image of taking whatever cares or burdens of our lives - worries, grief, hurts, anger - and placing them on Jesus' back as I walk with Him on life's journey. As I hike up the mountain or down into the valley, Jesus is walking ahead of me, guiding me along the path with my heavy backpack of burdens on his shoulders. But that implies that our burdens are still with us on the journey, that Jesus keeps those burdens as we walk together. And our burdens actually need to be cast away, or released, since they get in the way of a full relationship with the Lord. Recently, God gave me a vision that has changed my perspective on what it really means to cast our cares on Him. He showed me the image of having to throw the cargo overboard on a ship during a storm. And it made me wonder, why did people do that during Bible times? We see in the story of both Jonah and Paul that they were on a boat that was in danger of sinking because of a storm. The crew starts throwing its cargo overboard, so why did they do this? To lighten the ship. A heavy cargo makes a ship sit deeper in the water, which is dangerous in shallow water. The crew threw the cargo overboard so the ship would sit higher in the water in case they were blown near land, where their boat would get destroyed on the shallow reefs, rocks, and harbors. If the bottom of the ship ran aground miles from any shore, they faced the prospect of being tossed into the sea. Thus, when you are faced with life or death, everything (even the food) becomes expendable. Lightening the ship also stabilizes it in rough seas. If the ship got tossed to one side and became unbalanced, a heavy ship would be more likely to follow the energy and due to inertia (the law where objects in motion want to stay in motion), it would tip over. 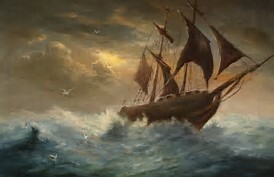 Further, throwing cargo overboard makes the ship go faster in case the men wanted to try to outrun the storm. With this analogy, God was showing me that there were some things I was holding onto, that I needed to throw away to lighten my ship. The storms that will hit all of us at some point or another, can serve as a way to force us to throw away some things we view as "precious cargo," such as a job, money, pride, rebellion, or anything else that keeps us from relying solely on Him. When the seas are quiet and the ship of life is cruising along smoothly, we aren't challenged to let go of some things that could make us stronger in the long run.